Also serving communities of Millersville. There are 37 Assisted Living Facilities in the Lancaster area, with 12 in Lancaster and 25 nearby. The average cost of assisted living in Lancaster is $3,351 per month. This is higher than the national median of $3,346. To help you with your search, browse the 74 reviews below for assisted living facilities in Lancaster. On average, consumers rate assisted living in Lancaster 4.3 out of 5 stars. Better rated regions include Lititz with an average rating of 4.3 out of 5 stars. Caring.com has helped 6 families in Lancaster find high-quality senior care. To speak with one of our Family Advisors about assisted living options and costs in Lancaster, call (855) 863-8283. Promotion ends in 63 days! Founded in 1729, Lancaster is one of the oldest inland towns in the United States, and its rich history reflects this. There's also many assisted living communities for seniors that are considering calling Lancaster home. In the Lancaster area there are a total of 63 assisted living facilities, with 12 in the Lancaster city limits and 51 in the nearby communities of Mountville, Columbia and Willow Street. These facilities play an important part in the local community and enable seniors who need support with the tasks associated with daily living, to live in a safe, welcoming environment. In Lancaster and all of PA, The Pennsylvania Long-Term Care Council is responsible for the oversight and licensing of assisted living communities. Lancaster is rated as one of the most polluted cities in the United States by the American Lung Foundation. Lancaster was ranked eighth worst city in the "year-round particle pollution" category and 13th worst in the short-term particle pollution category. As such, seniors with respiratory conditions should be mindful about spending too much time outdoors. With an average annual high temperature of 63 and an average annual low of 43 degrees Fahrenheit, weather in Lancaster is generally mild all year round, and shouldn't cause many problems for seniors who are vulnerable to extreme temperatures. Lancaster has one of the highest violent crime rates across cities of all sizes. The violent crime rate is over double the national average at around eight per 1,000 residents compared to four per 1,000 nationwide. The rate of reported property crime is more than double the average of the state at around 36 per 1,000, compared to approximately 17 per 1,000. Seniors may feel at risk living in an assisted living facility in Lancaster as a result of these high crime rates. Pennsylvania doesn't tax pensions, Social Security benefits or any other types of retirement income. Therefore, it is a good choice for seniors looking to save money towards their assisted living accommodation. The Lancaster area is home to world-class medical facilities, including the Lancaster General Hospital, in the event of medical emergencies or illness. Lancaster has an array of community resources for seniors, including the Lancaster Neighborhood Senior Center, an organization that as well as two other senior centers. Assisted Living costs in Lancaster start around $3,351 per month on average, while the nationwide average cost of assisted living is $4,000 per month, according to the latest figures from Genworth’s Cost of Care Survey. It’s important to note that assisted living rates in Lancaster and the surrounding suburbs can vary widely based on factors such as location, the level of care needed, apartment size and the types of amenities offered at each community. 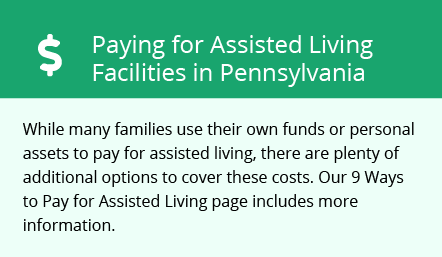 Pennsylvania doesn't provide financial assistance to residents in assisted living via Medicaid. However, an addition to Supplemental Security Income can be claimed to help assist with the costs. Lancaster and the surrounding area are home to numerous government agencies and non-profit organizations offering help for seniors searching for or currently residing in an assisted living community. These organizations can also provide assistance in a number of other eldercare services such as geriatric care management, elder law advice, estate planning, finding home care and health and wellness programs. To see a list of free assisted living resources in Lancaster, please visit our Assisted Living in Pennsylvania page. Lancaster-area assisted living communities must adhere to the comprehensive set of state laws and regulations that all assisted living communities in Pennsylvania are required to follow. Visit our Assisted Living in Pennsylvania page for more information about these laws.